STURGIS, SD – The rodeo world has lost two legends this month with the passing of rodeo announcer Hadley Barrett and famed rodeo stock contractor Harry Vold. A native of North Platte, NE. who made his home in Colorado, Barrett’s was perhaps the most recognizable voice in the sport of rodeo. Barrett turned his mic off for the last time at San Antonio (Texas) Stock Show & Rodeo in February 2017. He passed away March 2, 2017 as a result of heart failure while at University Hospital in Denver, CO. He was 87. 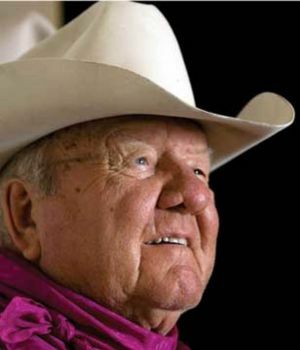 Harry Vold of Avondale, CO., 93, was known as the ‘Duke of the Chutes’. Born on a ranch outside of Panoka, Alberta, Canada Canada, he spent his early years scouting horses for stock contractor Leo Cramer of Big Timber, MT, later working with the Butler Brothers out of Oklahoma, one of the top three rodeo stock contractors at that time in the 1960’s. Vold, while operating the Harry Vold Rodeo Company, was chosen PRCA Stock Contractor of the Year 11 times (1982, 1987-96). He is one of only two stock contractors to provide animals for every National Finals Rodeo, which has been held annually since 1959. A memorial service will be held at 1 p.m. (MT) March 20 at the ProRodeo Hall of Fame in Colorado Springs, CO.
Be sure to tune in when Francie Ganje will tell us more about these rodeo greats; a story of a colorful career that almost didn’t happen and how the legacy of one of rodeo’s most respected stock contractors had its beginnings in Ekalaka, MT.